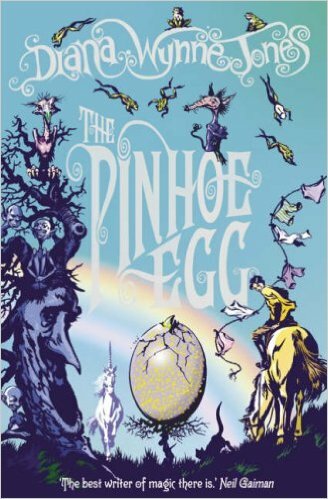 The Pinhoe Egg is simply Diana Wynne Jones at her best. This final Chrestomanci book has a stellar cast of heroes, animals, and villains. It takes us out of Chrestomanci Castle and down into the surrounding villages, exactly where those who live there don't want "The Big Man" and his family to be. The villages are mostly populated by magical families of long-standing, the Pinhoes and the Farleighs, and they have a war brewing between them. This is because the head of the Pinhoe family has gone a bit mad and has begun using her power against her friends and enemies alike. The best hope of stopping her comes from her grandchildren, Marianne and Joe, but their lives soon become entangled with those of the Castle kids and everyone has to figure out what they are best at before they can help others. I honestly got teary a couple of times while reading this one because it is just so wonderful. Of all of DWJ's many worlds, this is the one I would want to live in ... preferably as Marianne. I love the animals (griffins! unicorns! horses! cats! ), the very sweet Jason/Irene story, the parallels between Cat and Marianne, the partnership of Joe and Roger, even the adventures of Chrestomanci himself. And I love that Cat is still trying to recover from the damage that his sister did to him in Charmed Life and trust himself and others. This is probably-definitely on my top five DWJ books of ever list. Question of the Day: There are three different kinds of magic in this story: enchanter magic, dwimmer (natural magic), and the hybrid tech-magic that Joe uses. Which kind of magic would you most like to have? My answer? If you can't tell from many of my questions this month, I really, really, really wish I could live in a world with magic! As for which kind, I think it would be the strong dwimmer that Cat has. I have a pretty brown thumb so the ability to make things grow and thrive seems like magic to me even coming from those who can do that in our world. The connection to animals like Syracuse would be amazing too. Sigh. p.s. Don't miss Deborah O'Carroll's humorous How to Read a Diana Wynne Jones Book post! I've always been a dwimmer girl, even before I knew what it was. :) And yes, this would be a lovely world to live in, although I'm also fond of Caprona. Caprona would be great as well! Although I'd love to be a dwimmer person, I'm pretty sure I'm not. It would definitely be tough to want one kind of magic but have another. Thank you so much for participating! It's been fantastic to have you read with me. I'm so way late to the party here. Heh. I loved this book! I did wish for more fallout from Charmed Life, but maybe if I went back and reread the series (which sounds lovely just about now!) I'd see more than I did then, when I was looking for something very specific. It's interesting that these two books were the bookends of the Chrestomanci series. Cat's story is probably the most complex.